Aproved medicine for the yellow Jaundies Take a pint of muskadine a pretty quantity of ye inner bark of a barberry tree three Spoofuls of ye greenest goose dung you can get take away all ye white spots of it lay them in Steep all night on ye morrow Strain it and put to it one grated nutmeg one penniworth of saffron dried and very fine beaten drink it in ye morning. 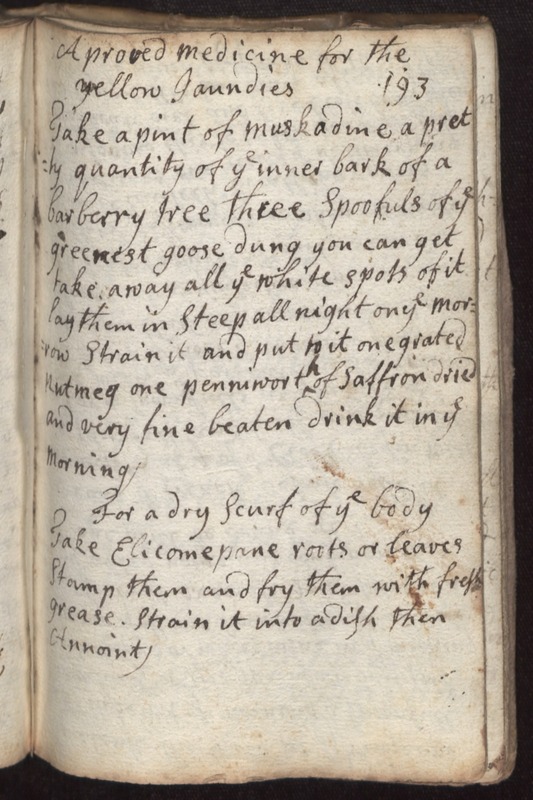 For a dry Scurf of ye body Take Elicomepane roots or leaves Stamp them and fry them with fresh grease. Strain it into a dish then Annoint.